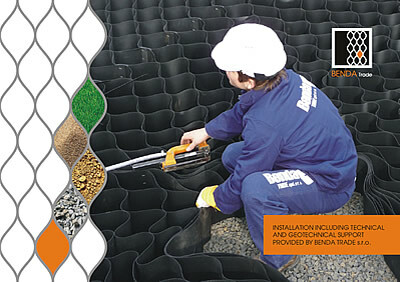 Cellular confinement system (geocell) is a system of smooth, surface-patterned (textured) or perforated PE–HD strips (50, 75, 100, 150, 200, 250 mm in depth) connected in a series with collateral root penetrations vertical to the longitudinal axis. After dilatation and stabilization, the connected strips form walls of spatial flexible cells. Subsequently, these cells are filled with filling material (chosen according to the purpose of use and surface load): sand, gravel, earth, crushed stone, concrete, refuse excavated from the construction site, etc. - foundations of civil structures – highways, roadbed. Stabilization of slopes affected by surface erosion. Stabilization of stream channels and ditches. Significant growth of the load-bearing capacity after installation. Significant reduction of tension by overloading on the ground level. Higher parameters of strength and deformation of the pit base. Exclusion of excess values of differential settlement. Decrease of the depth compared to a standard structure built from crushed gravel. Heavy machinery may travel on the finished layer immediately, independent of weather conditions. Speed of placing: 800 – 1000 m2 / 1 working group (4 workers) / 1 day. Manual placing without using machinery. Possibility to use the original refuse excavated from the site. 4) TECHNICAL – GEOTECHNICAL SUPPORT PROVIDED BY BENDA TRADE S.R.O. Detailed proposal and geotechnical assessment of reliability of the designed structure. An unambiguously defined method for building the foundations. Technical supervision during the construction process. Assessment of reliability of the designed construction both analytically and numerically, via simulation of the tense-deformation state by the variation finite element method. Supervision performed by a geo-technical engineer who will check civil engineering and erection work.